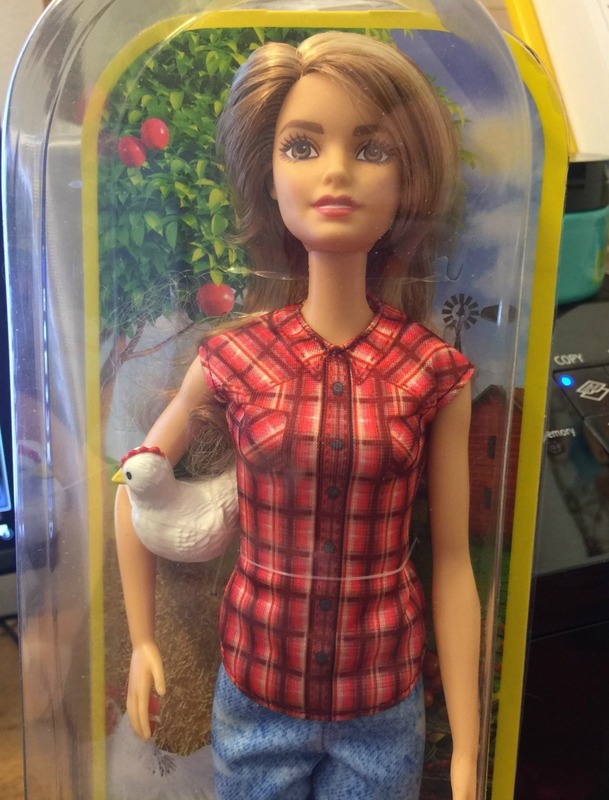 Okay…this is the coolest Barbie in the whole wide world. I’ve seen all the Astronaut Barbies and the Heart Surgeon Barbie and the Nuclear Physicist Barbie and to be honest, I was never really interested…personally. Then I saw this pretty little thing and I LOVE her. Oh, she still has the silly lonnnng neck that makes me laugh. But she also has work clothes on and just a regular person face. Thank you very much. Finally. 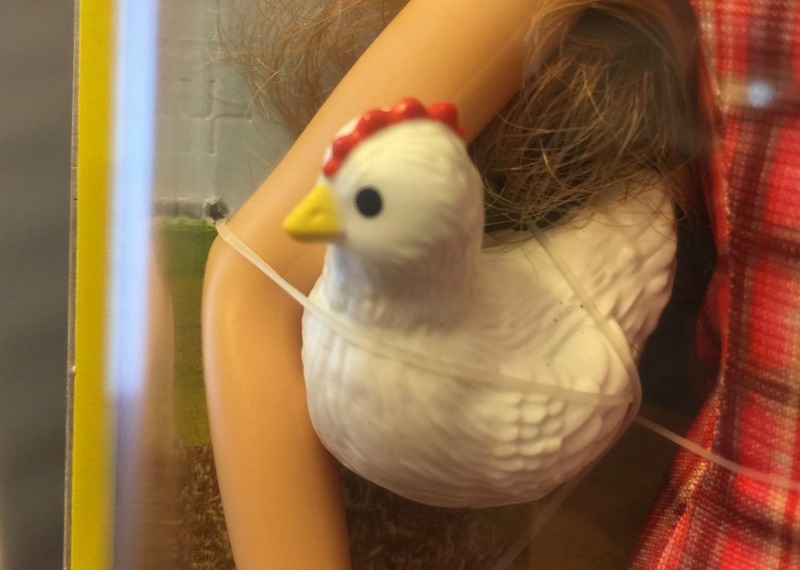 She’s holding a CHICKEN!! Just as she should be–hahaha! 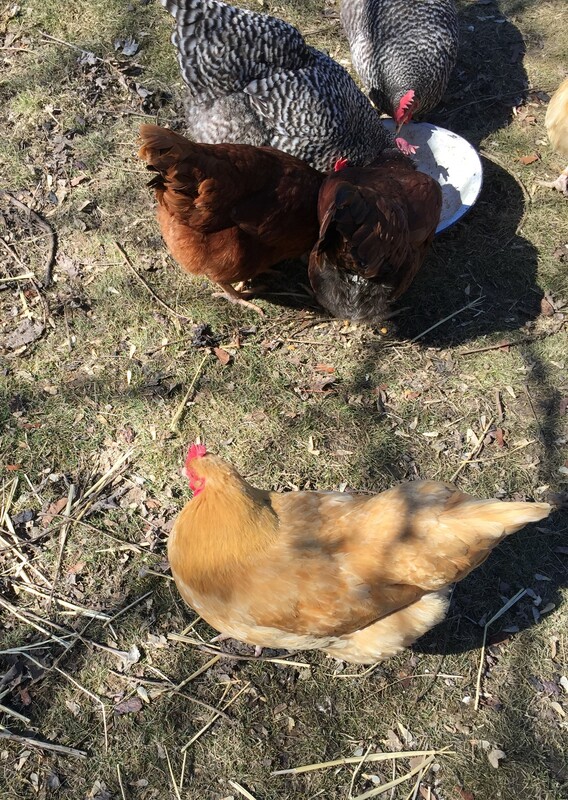 I really don’t want to donate the entire yard to the chickadees so it’s been the procedure to just give them an hour or so to run around and take dust baths or eat creepy bugs. But today, is Cinco de Mayo and so the chickies get a holiday. Of course, if they were actual Spanish chickens, they’d likely be celebrating much differently. Probably in a pot…or in Heaven. They love me. And they should. 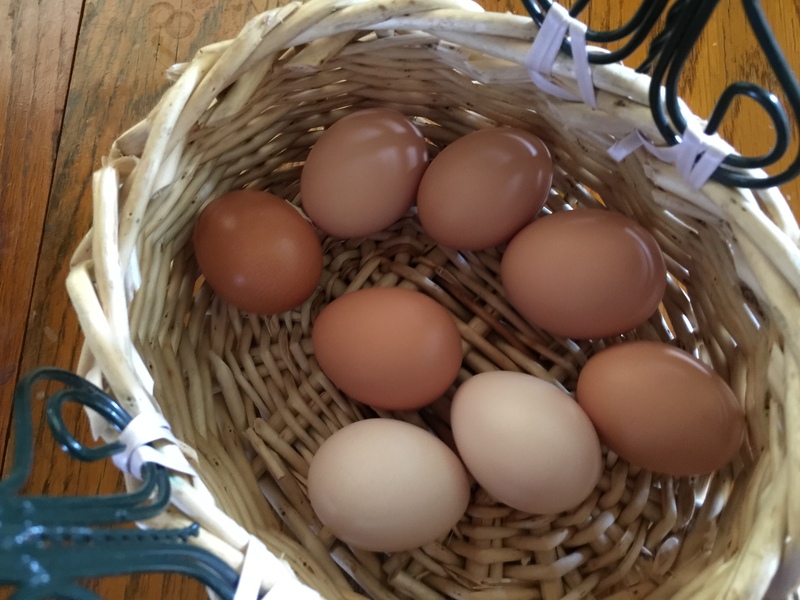 Sooooo…you know how my cute little chickens go in their nesting boxes once a day, and leave me a perfectly beautiful, light brown egg, then jump out and go their merry way? Yes, well, that is how it’s suppose to go. 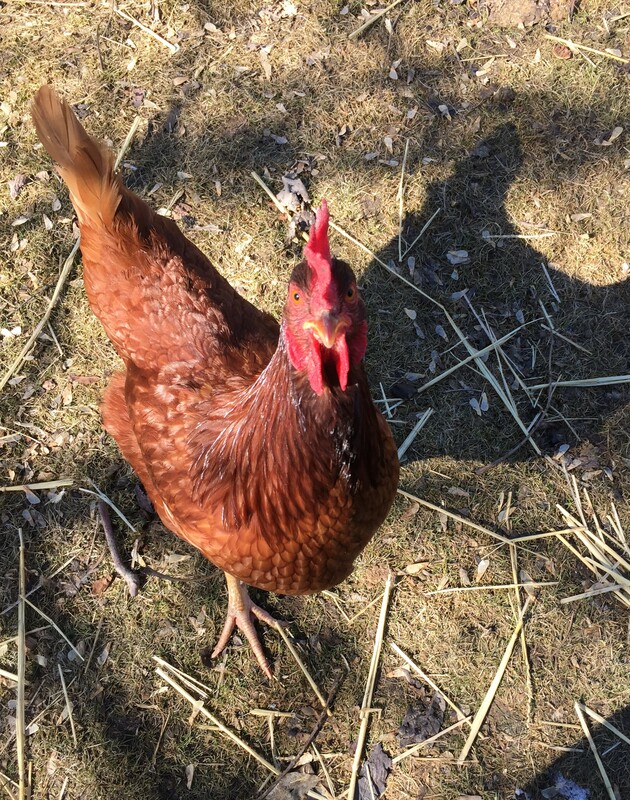 But all of a sudden, our sweet little Honey–a lovely Cuckoo Maran–stopped coming out of the nesting box when she was suppose to. 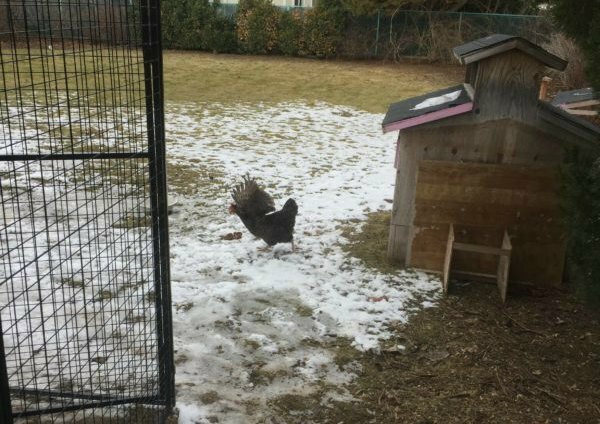 No matter how many times I physically took her out and set her in the yard, or the straw, or the snow (!) she would just end up right back in the box. 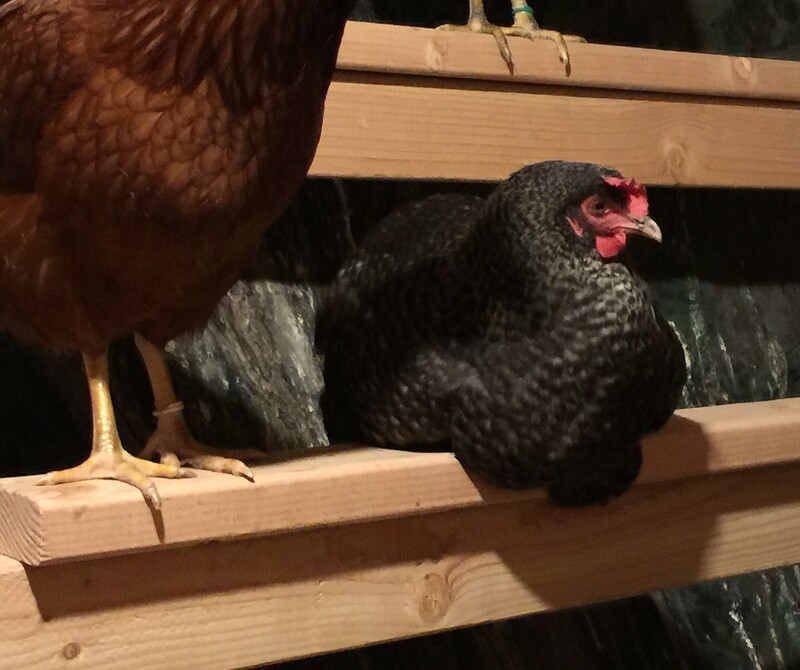 This, my friends, is what we call a “broody hen.” For some reason, a hen will see a clutch of eggs, just laying there, minding their own business, and get the idea that she should jump in and hatch them. Now, as sweet as that may sound, there are several things wrong here. 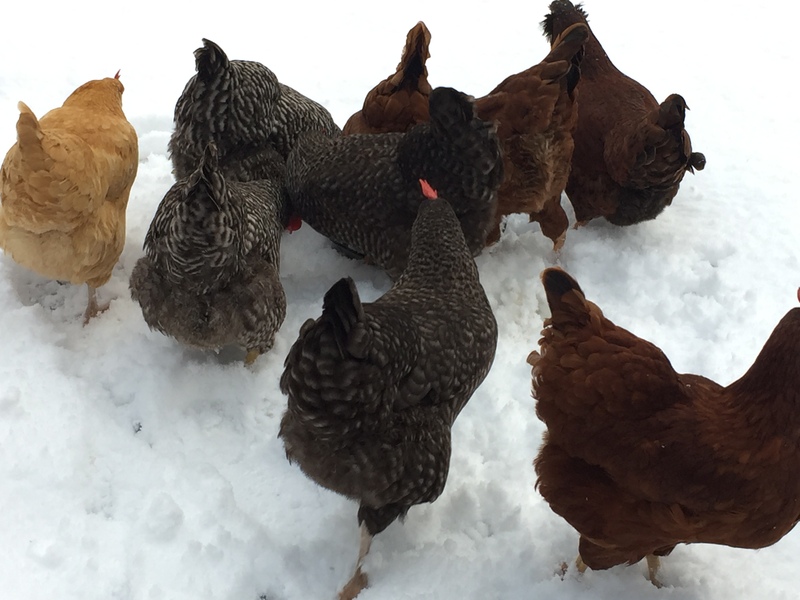 First, we have twelve beautiful hens–HENS, meaning, there isn’t a rooster around for miles. Therefore, Honey can sit there for a week of Tuesdays, but ain’t no babies hatching–if you know what I’m saying. Second, when a hen is setting on eggs, she doesn’t eat or drink properly for about 21 days–because she is too busy tending to her “babies.” It’s not particularly good for her–especially if there are actually no babies to make the sacrifice for. 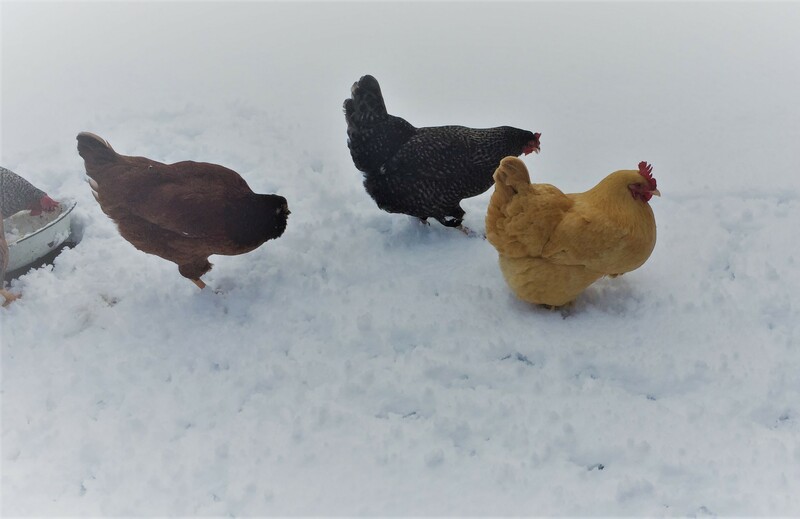 Third, Honey was setting on perfectly good, infertile eggs and when I would reach for them, or her–she started getting a bit feisty–pecking and growling at me. 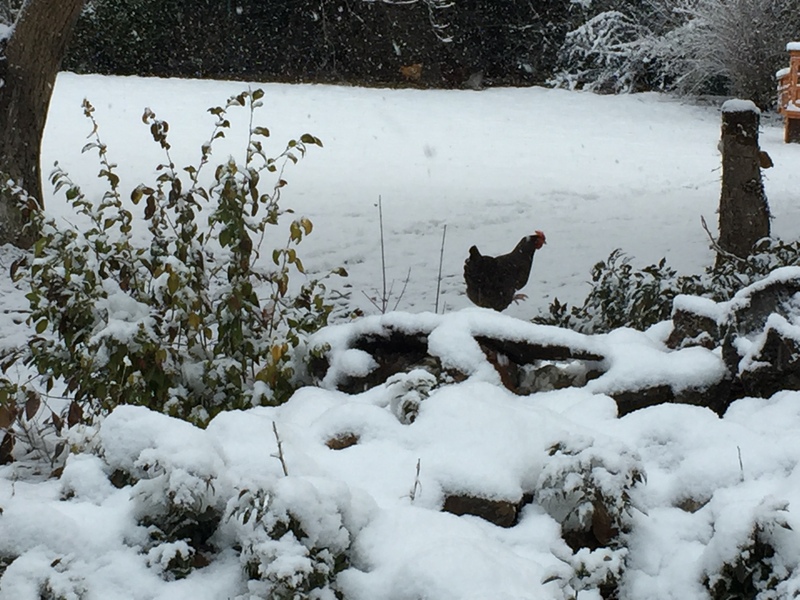 Yeah, I didn’t know that chickens could growl, but I’m telling you–they can. Kinda creepy. And lastly, while she’s having this little pretend mama adventure, she isn’t laying any new eggs. In fact, everyday she’s stubbornly setting on 5 or 6 eggs that aren’t even hers! I take her out, she finds a nest with eggs I haven’t gotten to yet, and claims them. Yes, yes. A bit tiresome, indeed. 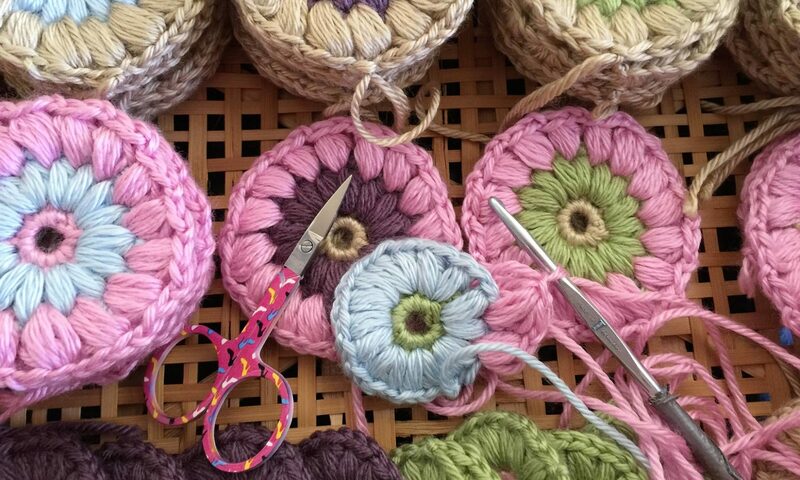 What to do…what to do? 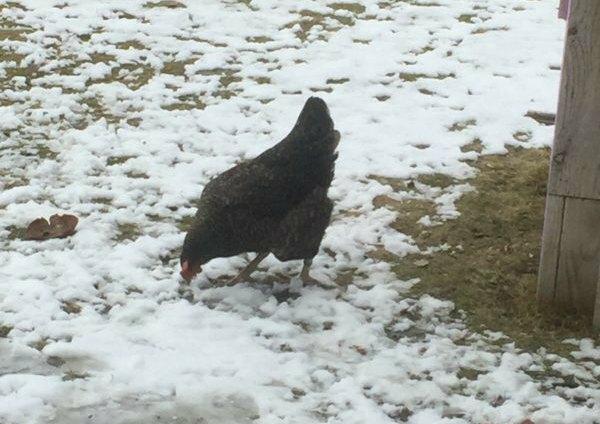 I checked out all the Chicken Advice blogs and read tons of ideas that didn’t set right with me. Some were silly and some were downright mean. I found the best idea at the Chicken Chick site. Tons of chicky wisdom here. Introducing the Broody Buster!! 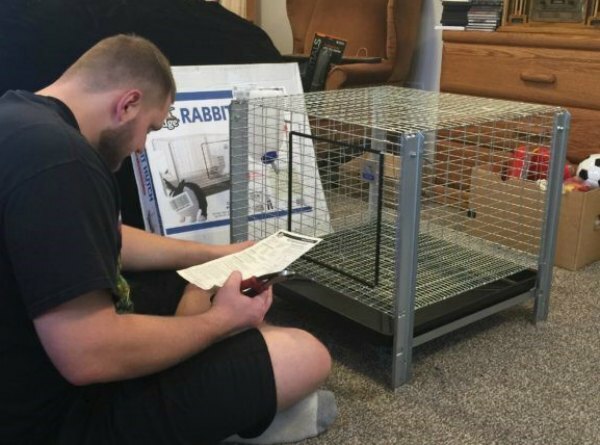 Ok, ok….it’s a rabbit hutch–but it’s gonna do the trick! 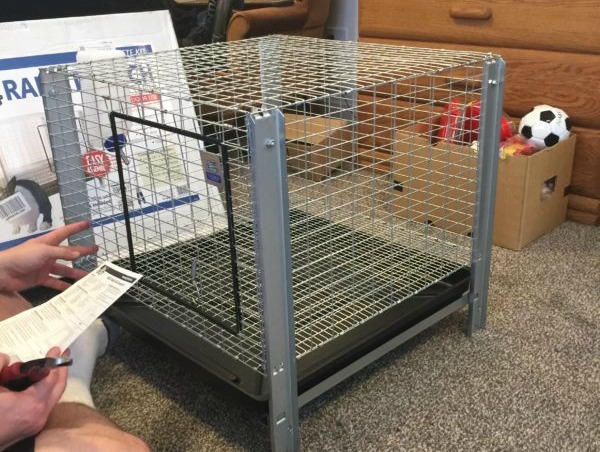 The idea is that you have to re-route all those displaced mama chicken hormones by putting her in a wire bottom cage by herself for a few days–with no eggs to sit on. Cool air to help her remember that all the eggs in the universe do NOT in fact, belong to her. My, oh my, oh MY…was she ticked! Little Honey was fussing and buzzing around in that cage, with a “Whyyyy I outta…” look on her little pouty-beak face. It only took 3 days of chicky time out and she was CURED!!! I open the cage door on day 3 and she whipped out of there like a bat out of….well, you know. It was fast. Our dear Honey has finally gone back to her normal chicken ways. And she has promised to behave herself from now on. I came out to take a video of the beautiful snow coming down and sweet little Shayah came out to join me. Apparently, her Russian constitution makes her very brave in all that snow. 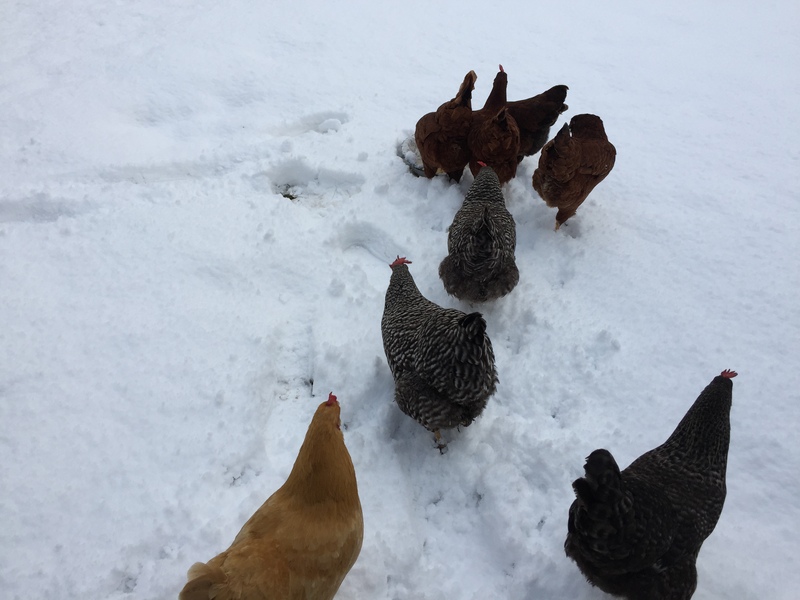 the girls had to think about it for a minute before venturing out. and a bit sticky in spots. 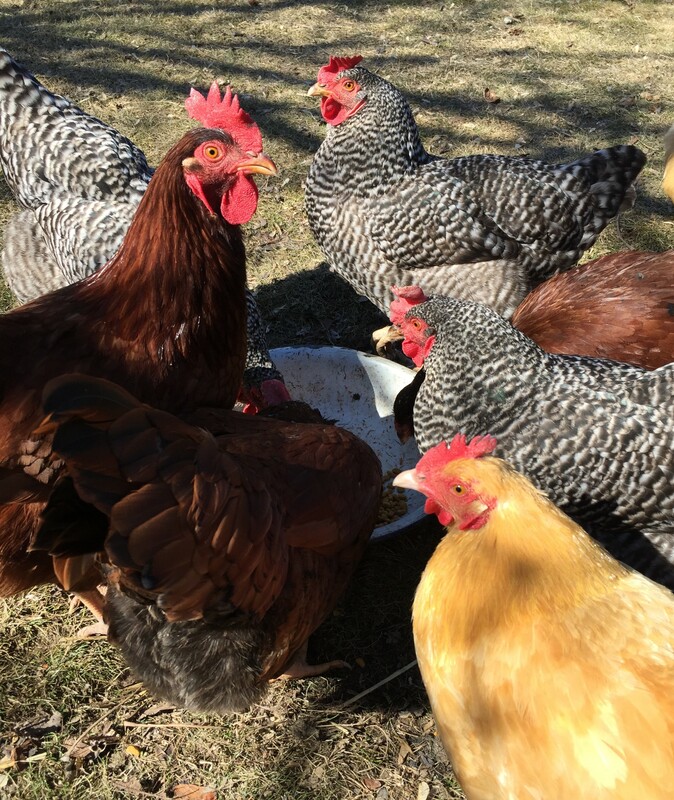 It helped to put their food bowl out there with a few apple cores–so they’d have a common goal…so to speak. Soon enough, they were old pros at this snow business and took off in every direction. Most likely won’t find any worms today Miss Ruby.